That’s Wendy Wester’s claim. She went to see Dr. Alan Brown, an orthopedic surgeon after her knee injury, when she was hurt skiing. Brown diagnosed her injury as an MCL tear. Wester was rushed to the emergency room after she experienced severe pain. Doctors ordered an MRI and found she had also torn her ACL, LCL and Meniscus. The MRI also showed she had a blood clot in her leg. A blood clot that could have killed her. The stakes are often higher when it comes to medical and legal services. Especially when people’s lives are on the line. An online review about Pizza Hut, positive or negative, doesn’t have as much weight or consequence compared to the effect online reviews can have for medical and legal professionals. 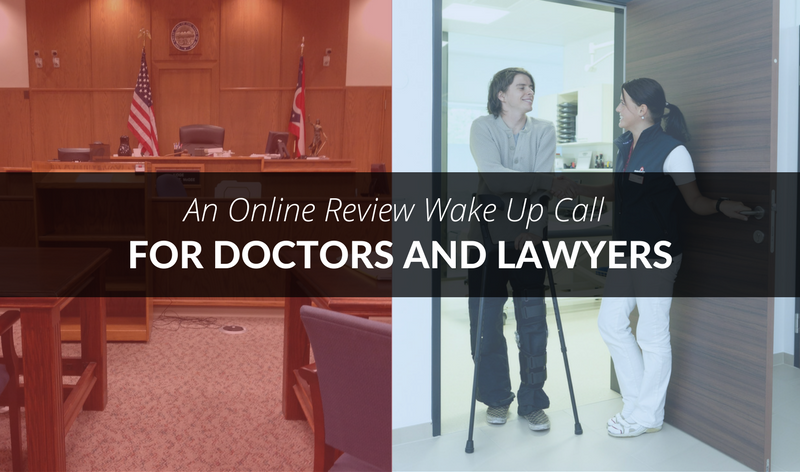 Online reviews often create all types of dilemmas for doctors and lawyers to sort through. Some industries simply don’t have the experience they need to handle negative reviews. Businesses in these industries simply want these reviews gone. They feel slandered or bullied by their reviewers. Because from their perspective, they have a lot to lose. A Harvard study found each star in a review affected the business owner’s sales by 5 to 9 percent. Berkeley economists found an increase from 3.5 to 4 stars on Yelp resulted in a 19 percent increase in business for a restaurant. Clearly there’s a lot of money at stake. What’s worse is the fact that customers aren’t always honest about the reviews they post. A Yelp reviewer known as Dan. 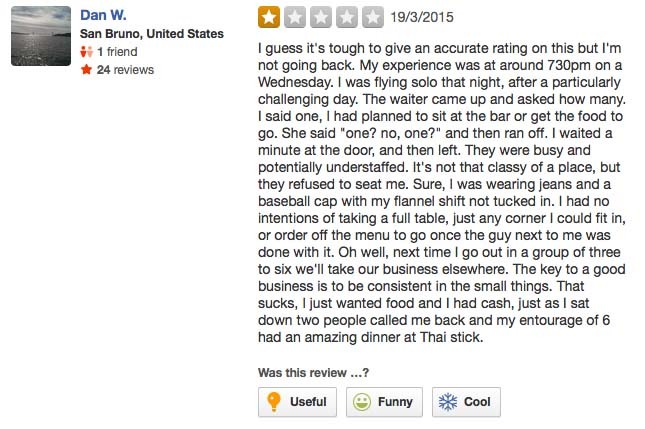 W, posted a one star review of Wonderful, claiming staff refused to seat him as he was alone. He mentioned waiting around for a table then leaving. Dan. W didn’t speak to anyone in the restaurant. In fact, he was in the restaurant for 22 seconds before leaving, and posting his hostile review. How do we know? The restaurant owners caught him on camera. It’s not just Yelp. Businesses are struggling to deal with these types of customers across a variety of channels. For service professionals like doctors and lawyers, dishonest or misleading reviews can have much larger consequences. But, why? Doctors and lawyers have historically been viewed as specialized, elite. Culturally for many, many years and before the age of reviews, they were able to attract and retain customers based almost entirely on or around their status in society. More caring, attentive and professional. There are a plenty of other attorneys and doctors who are more focused on customer needs and concerns. That’s a customer’s perspective going in. What if you’re not willing to do what it takes to earn their business? If you’re not able to get the results they want, they’ll simply take their business elsewhere. These details (or their counterparts) matter in other industries. The status, expectations and risk involved with the legal and healthcare industries are far reaching and potentially devastating. For example, Dr. Rolando Sanchez amputated the wrong leg from his patient, then he and his colleagues defended his mistake. Marie Karim wanted to file a malpractice lawsuit against the New York City hospital. She hired attorney Sheri B. Paige to handle her suit and paid her. Later she discovered the truth. Not only did Paige not have the required experience, she hadn’t even filed the lawsuit. The worst part? The statute of limitations had run out leaving Karim defenseless and out of options. A negative restaurant experience isn’t really in the same league. Too often, they’re handled in a reactionary way. Dr. Alan Brown, the surgeon at the beginning of our story who sued his patient, Wendy Wester for defamation after her negative review on Yelp. An attorney was awarded $350,000 in damages after a client posted defamatory reviews on Avvo.com, Lawyers.com and other sites. Nima Dayani, a Manhattan dentist sued five patients in four years for bad reviews. Dr. Jay Pensler, cosmetic surgeon sued three women each for $100,000 compensatory and punitive damages after they posted negative reviews on Yelp and Citysearch. Stephen Biegel, a San Francisco chiropractor, sued his patient for defamation over a billing dispute. The stories, the court cases, go on and on. Over and over we see businesses struggling to accept a customer’s opinion of them. Professionals in these industries are used to a certain amount of prestige and social capital. But that is slowly fading away. 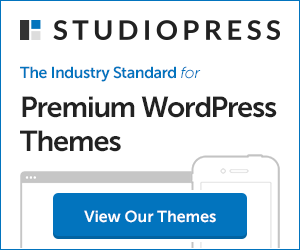 So How Should These Professionals Handle Negative Reviews? Begin with thank you. Thanking reviewers for their feedback sends an important message. It tells current and future customers that they’ll be heard. You’ll take the bad news they deliver, listen intently and make changes. It shows them that you’re mature enough to sidestep the rhetoric – the name calling, slander, bullying – they throw at you. You’ll take the meat and leave the bones. This is important whether the review is positive or negative. Next, empathize with them. In their empathy series, Cleveland Clinic shares patient stories highlighting the importance empathy plays in patient professional interactions. These stories are traumatic with a surprise at the end, showing why empathy is so important. It’s a relationship cornerstone that needs to continue indefinitely, even when you’re in the midst of a customer’s negative review. Finally, look for trends. If a single customer complains about the cleanliness of the waiting room or a particular doctor’s bedside manner, listen. Apologize if appropriate, do what you can to rectify their problem, then show them how you’ll fix the problem. Keep this problem in the back of your mind. A complaint from one patient or client is a problem. A complaint from 20 or more is a catastrophe in the making. 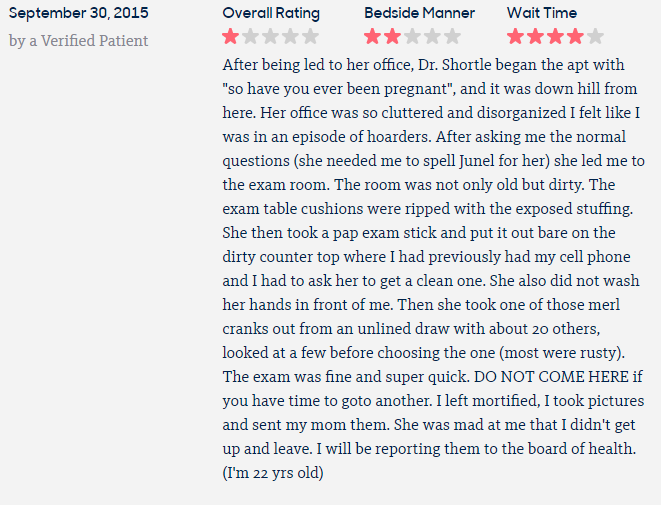 Here are a few verified reviews for a ZocDoc OB-GYN based in NY. 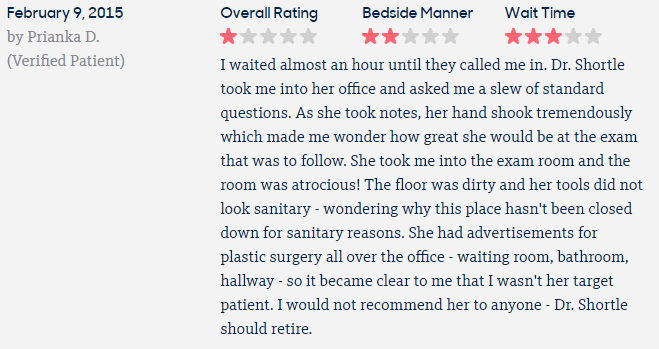 Another patient uses similar language to describe her experience. Seeing the trend? Most professionals ignore their potential crisis. They argue with clients and bicker over seemingly minor details. From their perspective, the reviewer is doing damage to their business. Research shows there’s a lot of money to lose. So they do their best to fight back. Unfortunately their inability to see the situation from their client’s point of view creates a disaster. As it turns out there is something you can do and it doesn’t involve fighting. In fact, I’m about to show you a clear strategy you can use to deal with the root cause permanently. Do it right and you counteract the damage from a negative review. Neutral. Approaching your business with an agnostic point of view. They don’t know what they don’t know. These clients are less forgiving, choosing to judge your business on its merits. They’re neither for or against you but can quickly be converted based on your performance. Positive. Clients are aware of you and they value what you’ve created. These clients typically want to stay, have to stay or both. They’re far less likely to post a negative review, choosing to be positive or say nothing at all. They’re also more likely to share a positive recommendation with other prospective clients. Negative. These clients view your business as an inferior, viewing professionals as a subordinate, someone they view as “the help.” These customers don’t have a relationship with you. These customers are far more likely to post a negative review. What about the review sites themselves? Aside from the specific questions you should ask, what information should clients include in their reviews? What should providers include in their responses? Share your experience with the people you’ve interacted with. Don’t post negative reviews for the attorney on the other side for example. Be brutally honest with your experience. Share your concerns, experiences and frustrations openly; doing this gives your providers the things they need to make important changes in their business. This affects other customers. Be kind, be helpful, transparent. Be a decent human being. Don’t go out of your way to slander, humiliate or hurt providers or patients. Standard advice that seems to be common sense for the vast majority of people. That said, it’s important to remember this especially when emotions are high and tempers from a negative review are flaring. Imagine you’ve just received a brutal and negative review from a very unhappy customer. What do you do? How do you use the right strategy to relieve their pain, solve their problem and restore the relationship? More importantly how should you respond if you’re looking to attract new clients lurking behind the scenes? You segment your customers, sorting them into neutral, positive and negative buckets. Then you focus your attention on the right customers, at the right time. 60 percent of your time on neutrals, doing your very best to convert them to positives. 30 percent of your time with negatives doing what you can to respond to their complaints, fears and frustrations. 10 percent of your time with positives. Continue preaching to the choir, recognizing and thanking them for their support. Show them you value their feedback, doing what you can to nurture the relationship. This is how sophisticated professionals attract customers. The negative reviews and lawsuits tell a different story. Professionals – doctors, lawyers, surgeons – are sensitive about their reputation. There’s a strong link between their personal and business identity. Many of these professionals are willing to sue to defend their good name. Which means patient reviews do matter. 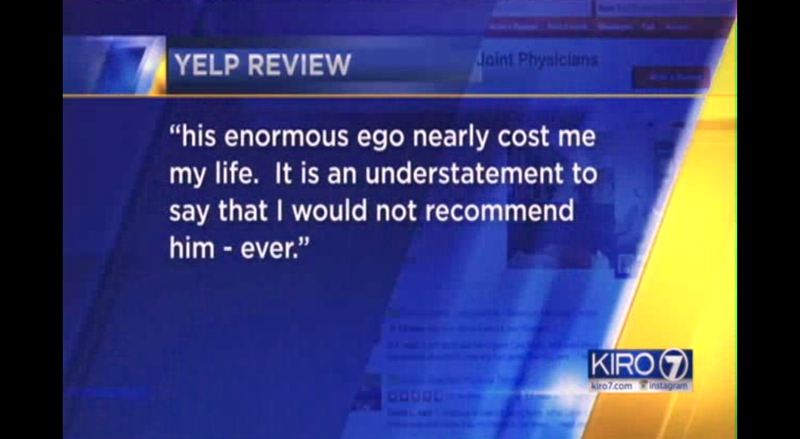 Before the age of reviews, patient reviews didn’t matter. Professionals won patients through insurance, hospital and industry associations. Those days are in the past. These days a negative review is all a patient needs to bury your business, often times for good. Everything’s changed. Encourage customer reviews. Get them first, get them often. Do what you can to convert as many of your neutrals into positives. Build an audience and you’ll have the support you need to deal with negatives. It’s not a business problem, it’s an industry problem. Too many professionals don’t have the experience and training they need to handle negative reviews. Many businesses simply want these reviews gone. Their goal: erase negative reviews as quickly as possible. You know better. You know it’s better to overwrite rather than erase. To encourage instead of punish. But it all starts with uniqueness. Create the right kind of relationship and they’ll want to stay, lawsuits and litigation becoming a thing of the past.